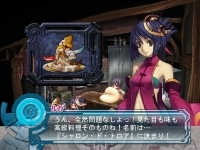 Ar tonelico II: Melody of Metafalica is set a year and a half after the events of Ar tonelico: Melody of Elemia. It’s a true sequel, though that does not become apparent until later in the game when references to Melody of Elemia start cropping up. The story centers on Croix, a knight of the Church of Pastalia, and a baffling epidemic that has been crippling many Reyvateils, the world’s magical songstresses. As these things go, he has the choice of pursuing one of two lovely Reyvateils — with a third option opening up later — in a quest to help the goddess or overthrow her. The story evolves into an epic scheme of politics, religion, and romance in a world with a beautiful, rich culture and complex history. Somewhere in all of that, there’s a really good story, but you just can’t find it in all the mindnumbingly boring and inane dialogue, all made worse by a shoddy localization. It’s hard to tell how much of the problem is due to poor original writing or lazy localization, but regardless of where the blame lies, the story is a jumbled mess of confusing mysteries and mixed-up motives acted out by flat characters with inexplicable and erratic behavior. Melody of Metafalica (say that out loud and hear why it would get Freud’s attention) continues the tradition of being an RPG that thinks it’s also a tamed-down H-game. The classic “I want you to Dive into me!” declarations still pop up. Inserting a Grathnode crystal into a Reyvateil’s installation port still hurts her, and it’s even less funny now than it was the first time around. The innuendo of Melody of Metafalica is very heavy-handed; some of it hints at faux lesbianism and faux threesomes. In the game’s epic shark-jumping moment, Croix participates in an emergency Dive with an underage Reyvateil and “breaks” her “Boundary Gate.” It was awkward enough with Lyner and Misha, who only appeared underage, and in Melody of Metafalica, it crosses the line. Sadly, if Ar tonelico II is remembered for anything, it may be for having the worst localization of its generation. While Melody of Elemia had plenty of text errors, Melody of Metafalica somewhat exceeds it. There are glaring grammatical errors, misspelled words, and missing commas to the point that the meaning of the text is muddied. It looks very sloppy and highly unprofessional, and it makes Agetec look like Alexander O. Smith. Honestly, there’s no excuse for having this many text errors. Some of the text is translated very flatly so that it lacks character, and there’s an odd fixation on using “crap” as an expletive to the point that it trivializes the most dire events. In addition, one recurring event dialogue box has Japanese text, and another has a text glitch. The text overlaps in certain synthesis recipes, so you can’t read ingredient names. There’s also a point in which the dialogue tells you to go to one location, but the objective in the save menu lists an entirely different location. The most egregious sin, however, is the game-crippling bug in a boss fight near the end of the game. In the third round of combat, the boss uses a move that has a glitched text string, which causes the game to freeze. You can work around it with powerleveling and using a certain strategy, but that does not excuse the problem. It’s a shame that NISA let this game — a console game, at that — hit the market with such a devastating bug. As far as gameplay goes, Melody of Metafalica builds on the previous game’s systems. Instead of the painfully embarrassing Grathnode installation system — now reduced to a painfully embarrassing plot device — players now have to sit through voyeuristic bath scenes in which the Reyvateils soak in water filled with crystals, bath oils, and tub toys. It limits Reyvateil customization and makes it almost luck-based to boot. The sim dating elements are back, and they haven’t changed that much, with Diving still playing a key role. There’s also a system that allows you to contain and cure infected Reyvateils, then use them to boost your power in combat. Infected Reyvateil attacks are random and irritating; sometimes they block your path and you have no choice but to clear them, regardless of how difficult they may be for your party. Once the Reyvateils are cured through a sometimes perplexing process, they can bestow very useful bonuses to party members, which means that the entire process is actually worthwhile. Sometimes, you can create delectable dishes that replenish an ally’s HP. Sometimes, it’s better to throw your creation at an enemy and give them food poisoning. The battle system has had one major change; it now hinges on button triggers. 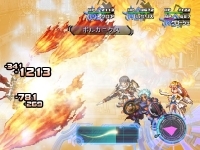 During the Attack Phase, players have to mash square and X while pressing in different directions on the control pad, like in the Tales series, but during a limited amount of time, like in Valkyrie Profile. During the Defense Phase, players have to defend the Reyvateils by pressing square or X as a small green line moves through a gauge. 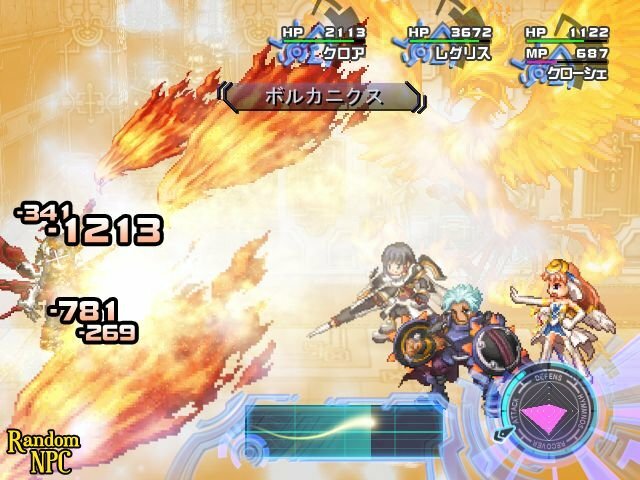 It’s an interesting improvement over that of the previous game, but sometimes you have to watch the gauge while the screen is shaking and filled with explosions and bright light. Then it becomes dizzying and almost futile to defend. Dungeon designs are complex enough to not be boring, which is refreshing considering the popularity of “straight path with one branch-off going to treasure” floorplans in most modern RPGs. However, the dungeons of Ar tonelico II have two major problems. The first is that floor designs are misleading. A path will go off into darkness but be blocked by an invisible wall, so it looks like an exit when it isn’t. Sometimes, there will be a cutoff path at the end of a hall, but when you walk into it, it’s an exit. Doors can be easy to miss due to the fact that they are completely flush with the wall and sometimes resemble wall decorations. Thus, dungeon exploration sometimes means feeling your way along the walls until you have the mini-map uncovered. The second problem is that several dungeons require you to walk through to the end, find a locked door, then backtrack through a few areas (and possibly back to the start) just to trigger an event or activate a panel that opens the door. To make things more aggravating, the walking speed feels very slow. Visually, Ar tonelico II seems like a step down from the first Ar tonelico. Objects, such as trees and bushes, are very flat, and the game looks like a pop-up book. As Croix moves, his surroundings zoom in and out in a weird manner. Sprite walking animations are atrocious; characters look like they are skating instead of walking. On the plus side, however, sprite animations in combat are very elaborate and quite acrobatic. Such artistic detail adds some depth and aesthetic appeal to the 2D graphics. The series’ emphasis on music sometimes leads to beautiful songs. Ar tonelico II does have some beautiful pieces in its soundtrack, but there are plenty of odd and annoying ones. Often, songs use voice samples as well-placed musical accents. But one of the most frequently heard pieces, a song heard while loading a save file and while in the Dive Shop, has a hushed Hymnos phrase repeated over and over throughout the entire song. It’s annoying, and I often hastened my way through the Dive Shop menu and wished that saves would load faster just so I could hear less of the song. There’s also a weird sound accent in a certain character’s theme that sounds like a sheep bleating. Voice acting is about the same as that in Melody of Elemia; it’s not awful, but it’s not that great either. It can be switched to Japanese or turned down completely, so that’s a plus. Sound effects are about the same. 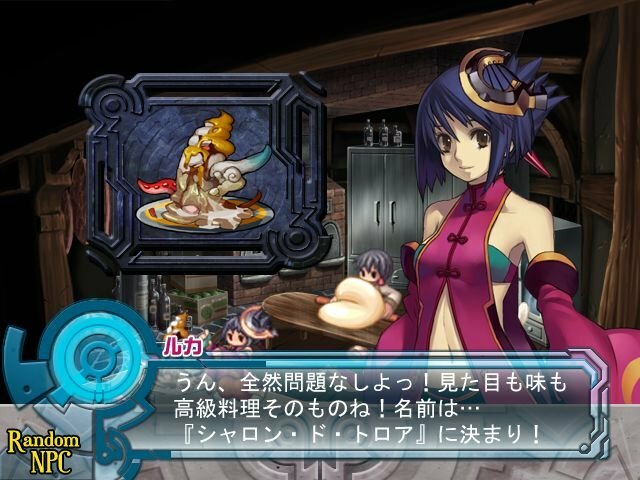 Overall, Ar tonelico II has a low-quality feel, mainly due to the poor localization. If not for the text errors and the glitches, Ar tonelico II would be on par with its predecessor as a decent niche game. It deserves credit for trying to replicate the experience of the first game and enhancing the battle system. I expected something as good or better than the previous title, which isn’t much as the first one had its own localization problems, and I am left feeling disappointed. Wow, I couldn’t disagree more with this review. I think the sequel is a *huge* step above the first game in every aspect, and while I am aware of some of the glitches, they haven’t broken the game for me at all. It’s possible to get through the whole game and never see the bug (or the occasional random freezing throughout the game), but the fact that it’s there and that it will bring you to a halt if you move at an average pace (rarely level-grinding, occasionally running from battles, minor participation in sidequests) make it a significant problem that lowers the score. It may not bother you, and it certainly doesn’t seem to bother some of the other fans, but it still counts in the review. I think that some of the system changes they added were an improvement that built on the original game — IPD curing/Girl Power, attack/defense button-mashing in combat — and I don’t know if I made that much clear in the review. But there were some spots where these things were bungled (contradictory IPD personalities, powerful IPDs blocking required paths), and then the localization problems totally pulled the game down overall.